The ASEAN-Canada Research Partnership, with the support of the International Development Research Centre (IDRC), Canada, is focusing on the theme of Natural Resource Management for Sustainable Growth in this second year of activities. Research under the theme of Natural Resource Management for Sustainable Growth should seek to address the challenge of finding means of improving systems for managing natural resources to allow sustainable economic growth and meet growing energy needs in the ASEAN region. The papers should explore how to do this without degrading common resources (increasing atmospheric pollution and greenhouse gas concentrations, and overharvesting and causing degradation of open access fisheries and forest resources) and with due regard to human security. Research must be analytical and policy relevant. 5 senior and 11 junior fellows have been selected for the second year of activities. Click here for more information on the 5 senior fellows selected. Click here for more information on the 11 junior fellows selected. These six-month fellowships (offered twice in 3 years) will usually allow 10 junior research scholars from ASEAN and Canada, to conduct projects on the research themes outlined in the ASEAN-Canada Research Partnership. Applicants are required to include a fieldwork component (with a focus on Southeast Asia) in their proposals and identify experts in Southeast Asian institutes they can potentially engage as supervisors. The fellowship also includes participation in a 10-day research workshop to be held in the University of British Columbia, Canada. The 2012-2013 fellowship focused on the theme of ‘Towards Balanced Growth – Alternative Development Models and Redistribution Mechanisms’. The 2013-2014 fellowship seeks to focus on the theme of ‘Natural Resource Management for Sustainable Growth’. Click here for more information on the junior scholars chosen for both rounds of the programme. Senior scholars and experts from Canada and Southeast Asia will be chosen to write policy-oriented papers on specific topics of strategic relevance to ASEAN-Canada ties. These papers would be presented at the ASEAN-Canada Forum. Click here for more information on the senior scholars chosen for both rounds of the fellowship (2013-14 and 2012-13). These workshops are held in each round of the fellowship to help guide junior researchers in the writing of their papers. These workshops are organised by our Canadian counterpart – the Institute of Asian Research (IAR) in the University of British Columbia (UBC). Designed to inform and engage Track 1 officials, this forum to be held in Southeast Asia, will disseminate research findings and facilitate discussions on key regional and bilateral issues. The forum will be held twice in 3 years. Click here to read about the 2013 ASEAN-Canada Forum and Symposium held on 20-21 August 2013. Click here to read about the 2014 ASEAN-Canada Forum held on 24-25 July 2014. While Canada has been a dialogue partner to ASEAN since 1977, the deepening of ASEAN and Canada Track 1 relations in recent years has increased collaborative efforts in addressing pertinent regional issues of common interest. However, improved relations at the Track 1 level will require more groundwork at the Track 2 and 3 levels. It is with this in mind that the ASEAN-Canada Research Partnership was initiated by the RSIS Centre for NTS Studies and the Institute of Asian Research (IAR) in the University of British Columbia. Supported by the International Development Research Centre (IDRC), Canada, this initiative is also a response to growing interest within the Canadian and Southeast Asian research communities to jointly examine ASEAN’s role and impacts, and exchange experiences in order to explore development opportunities and address social, economic and environmental problems. Planned activities in this three-year initiative will involve Southeast Asian and Canadian academic institutions, think tanks and NGOs, while establishing linkages with the ASEAN secretariat, government officials, civil society groups, multilateral agencies and other stakeholders. The ASEAN–Canada Research Partnership was officially launched on 20 January 2012 along the sidelines of the commemoration of the 35th Anniversary of ASEAN-Canada relations at the ASEAN Secretariat, Jakarta, Indonesia. Contribute to the ASEAN-Canada Plan of Action by providing a shared evidence base for policies and interventions. This theme seeks to address the challenge of finding development options or policy sets that achieve the ASEAN goals of greater regional integration and strong economic growth but without the increased inequality that has become pervasive in the last two decades. This theme seeks to find means of improving systems for managing natural resources to allow sustainable economic growth without degrading common resources as illustrated by increased atmospheric pollution and concentrations of greenhouse gases, overharvesting and degradation of forest resources, as well as overharvesting of oceans and depletion of fisheries. This theme seeks to examine how countries should deal with aging populations, growing populations in others, increased intra-regional migratory movements and the impacts of these demographic trends on health and health care, other social services, and human rights policies. Click here to view the ASEAN-Canada Research Partnership brochure. A key element of this partnership is to ensure that the dissemination of research findings and recommendations in policy papers play a significant role in raising public awareness of issues and gaps, and possible ways to address them. Findings from the research partnership will be disseminated through blogs/memos, videos, monographs, policy papers and books. Blogs and memos will be disseminated via the RSIS Centre for NTS Studies’ Blog and the Institute for Asian Research’s Asia-Pacific Memo. The ASEANnews.net website has been launched! This website provides a venue for discussion of current news and issues around ASEAN, specifically those that touch on development and social issues related to its framework for regionalism and how it impacts on the daily lives of its constituency in South-east Asia. 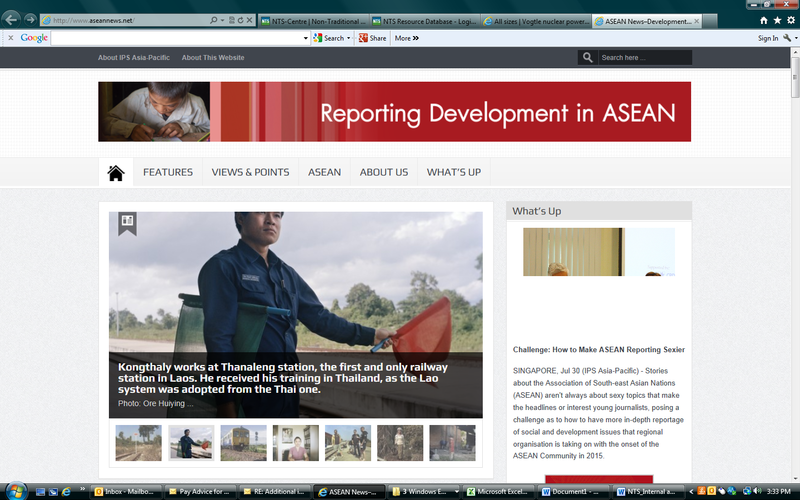 It aims to help create and encourage more space for reporting and analyses of development-related issues within ASEAN. This focus stems from the recognition that while ASEAN gets a lot of mention in the media, news coverage of it is heavily focused on following its summits, annual meetings and high-profile events. This event-based definition of ASEAN-focused often leaves little room for in-depth analysis and investigation of the role and impact of ASEAN’s brand of regional integration, at a time when the 2015 date of the ASEAN Community nears. 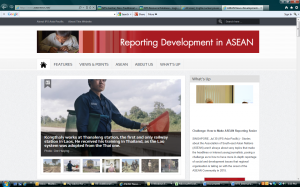 ASEANnews.net features articles written by South-east Asian journalists, analysts and experts. They offer readers a mix of voices and views around current issues and trends relevant to South-east Asia’s key regional grouping and the development of its peoples.